Beef ‘O’ Brady’s Punta Gorda has a TV screen on practically every inch of its walls. 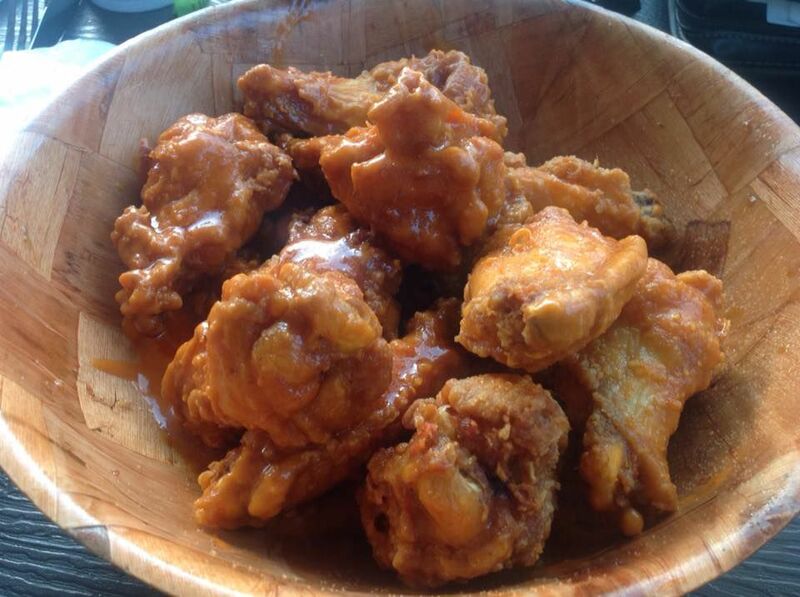 Chubbyz wings are perennial favorites, Super Bowl or not. Where you want your team to end up in the Super Bowl: The End Zone. Snook's 40-by-60-foot HD screen plays the game on the side of Royal Palm Marina. Where will you watch Super Bowl LIII? Where’s the Super Bowl party? If you want to pick the perfect Super Bowl party, you need all the stats. Here are a few. If you don’t see your favorite hangout listed, give them a call. Who’s got the biggest screens? Snook’s Bayside Restaurant and Tiki Bar, now with a full-liquor bar at 779 W. Wentworth St., Englewood, throws its Super Bowl Party bayside from 2 to 10 p.m., along with a $12.95 pig roast from its monster smoker, served with yellow rice and black beans. Coastal Jamz will provide live entertainment, until the game kicks off on a mammoth 40-by-60-foot HD screen projected on the side of Royal Palm Marina. “It’s like watching in a movie theater,” said proprietor Kevin Sawyer. Size also matters to TT’s Tiki Bar on Charlotte Harbor. Not only do they have one of the area’s biggest tiki huts, they also boast a 25-foot inflatable screen playing the Big Game. They’ve also got a special show from 2:30 to 5:30 with Punta Gorda’s own Mike Imbasciani & his BluezRockerz, featuring guest Georgia bluesman “Gitlo” Lee. Game day at TT’s will go on until midnight, with football-themed food and drink specials starting at 5. The teams also square off on 22 feet of inflatable big screen at the Village Brewhouse in Fishermen’s Village. Who’s got the most screens? Chris Lansdale’s 10,500-square-foot sports mecca at Beef ‘O’ Brady’s, 1105 Taylor St., Punta Gorda, has more than 50 screens and a nearly booked-up party. Who’s got the least screens? Max Doyle of The Celtic Ray Public House announces a “no-football party.” To encourage camaraderie, limit fisticuffs and ensure authenticity, the Punta Gorda pub at 145 E. Marion Ave., won’t be showing the game. If you’re seeking a bit of peace, it’s the place to be. Who’s been throwing a party the longest? Nearly-60-year-old Portside Tavern vies for the Port Charlotte long-in-the-tooth title with the Kontos family, in town since 1980 and now running All-Star Sports Grill; Gatorz Bar & Grill, about to celebrate its 30th anniversary; and the 26-year-old Nav-A-Gator Bar & Grill. Portside, 3636 Tamiami Trail, is giving away a 55-inch, 4K, UHD TV and other prizes at this year’s party, along with food and drink specials. All-Star, 2360 Tamiami Trail, will have happy hour and drink specials from 11 a.m. to 9 p.m., and a $5 buffet and prize giveaway at halftime. Gatorz, 3816 Tamiami Trail, as well as its little sister, Punta Gorda’s Downtown Gatorz, will not only play the game on multiple TVs and one big screen — they’ll both give away a 55-inch set for a lucky fan to take home. Nav-A-Gator, 9700 SW Riverview Circle, Lake Suzy, will have free shots every touchdown and $13 buckets. Who’s got the luckiest name? At End Zone Sports Grille, 2440 S. McCall Road, Englewood, Massachusetts-born owner Joanne Anders’ most memorable Pats game ever was Super Bowl LVI in 2017. After the whole place got up and left, dejected that New England was losing, she was the only one there to celebrate a classic Tom Brady last-minute, come-from-behind win. This year, she hopes everyone else stays to the end, too. From 2 to 5 p.m. End Zone has music from 17-year-old local John Mayer sound-alike Andy Heath, 40 TVs playing the game, and wings and beer specials until midnight. Lighthouse Grill at Stump Pass, 260 Maryland Ave., Englewood, kicks off Super Sunday with surprise specials whenever somebody scores. All TVs will carry the game starting at 6:30. Although they normally close at 9 p.m. on Sundays, count on them to stay open if there’s overtime. Who pays the most rent? Harpoon Harry’s, in Punta Gorda’s Fishermen’s Village, still won’t soak you for beverages on Super Bowl Sunday. At kickoff, domestic drafts including Yuengling, Budweiser, Bud Light, Miller Lite and Michelob Ultra will be $2. Bloody Marys and screwdrivers are $4 all day every Sunday. While more than 30 TVs play the game all at once, with the sound turned up, a 150-inch projector screen will also show all the action. All-Star Sports Grill and Beef ‘O’ Brady’s Englewood have big Pats followings. But another traditional New England stomping ground is Chubbyz, 4109 Tamiami Trail in Port Charlotte, running the game on 22 TVs and a 7-foot big screen. They’ll have two-for-one happy hour until 7 p.m., prize-winning 50-cent wings (70 cents takeout) from open to close, $1 hot dogs and $3 nachos. Who’s got the most tailgate food? Leroy’s Southern Kitchen-Bar, 201 W. Marion Ave., Punta Gorda, is rolling out classic tailgating specials this year. They promise food and drink specials starting pregame at 5 p.m., with hot dogs and hamburgers, sausage and peppers, Philly cheesesteaks, nachos, chili, chili fries, wings, and Buffalo chicken, sausage and seafood flatbreads. Who’s throwing the coziest party in town? Zoet Snack Bar, newly opened at 27670 Bermont Road, Punta Gorda, has hot food, cold beer and three TVs for a homey Super Bowl party that you can top off with ice cream from Zoet Sweet Boutique. All domestics $2.75, Corona $3.50, Heineken $3.75 and 16-ounce Grolsch $4.50, from 5 to 11 p.m.
Calico Jack’s, 1950 Beach Road, Englewood, has the party on Beach Road serving drink specials and free pregame and halftime appetizers. PaddyWagon Irish Pub, 2681 Tamiami Trail, Port Charlotte, has $3 drafts, $3.50 16-ounce cans and $4.25 craft beers, along with a complimentary buffet courtesy of Jamal Hishmeh of Joseph’s Deli. Q’s Sports Bar, 4030 Tamiami Trail, Port Charlotte, will have free food and appetizers with a drink purchase, $10 domestic buckets and $14 import buckets. The party’s over at Ragin’ Cajun, but El Jobean Road keeps on jumping thanks to Pops Port O’ Call, 4230 El Jobean Road, serving a $3 buffet from 3:30 p.m. until kickoff. New Englander Chuck Cyr normally closes Burgundy Square Café, 227 Miami Ave. W., at 2 p.m. Sundays, but never on Super Sunday when his Pats are playing. The party starts at 5:30, with all the food and beer you can eat and drink for $30.